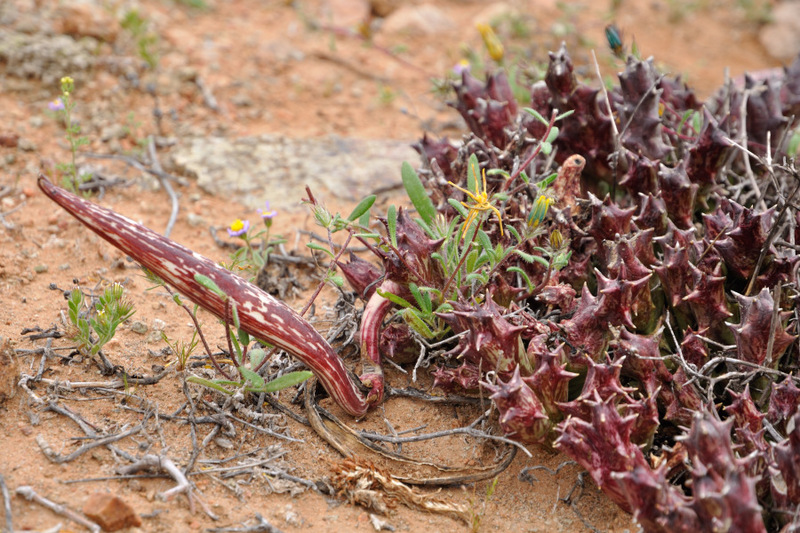 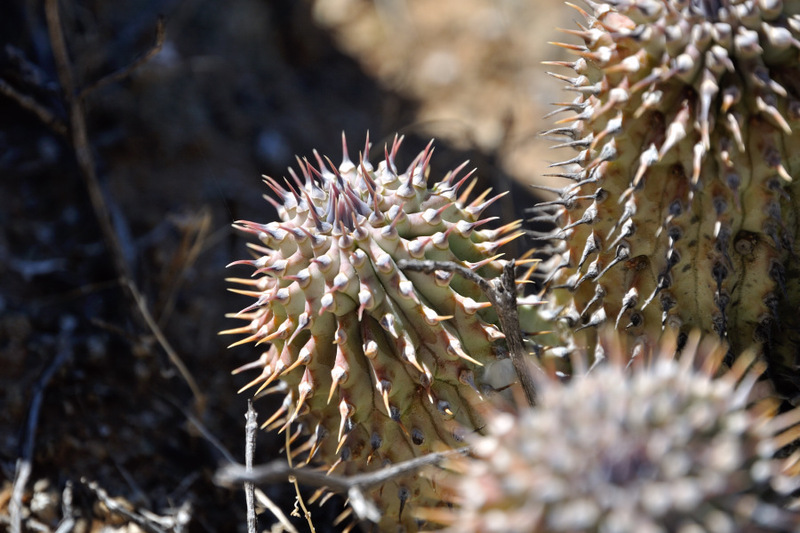 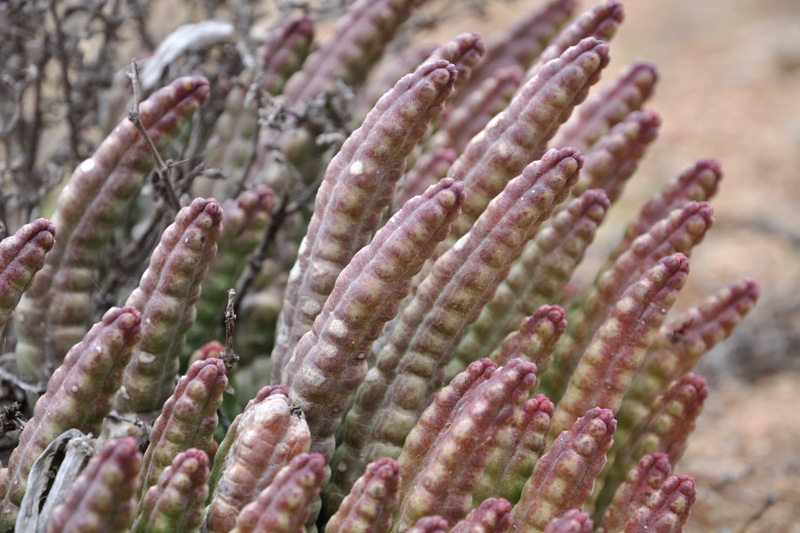 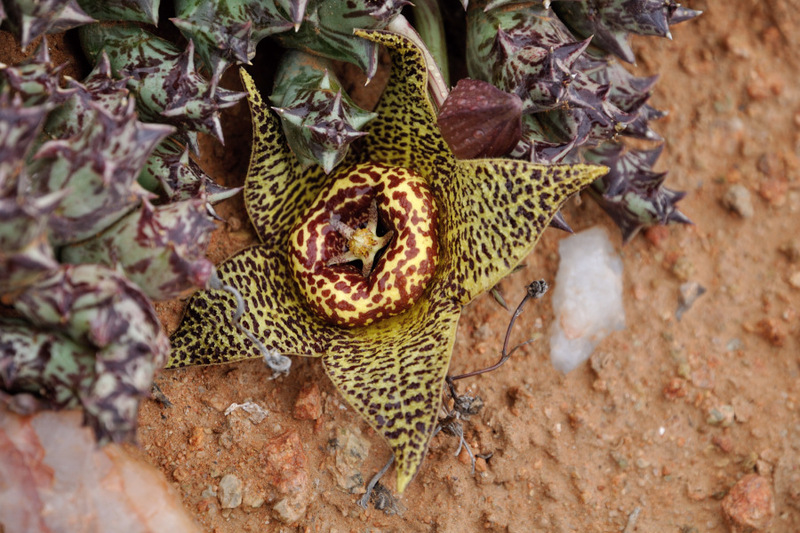 Pictures of Stapelia, Hoodia and Trichocaulon from my botanical tour to South Africa. 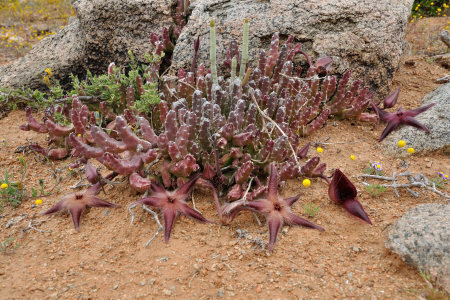 The Richtersveld desert, close to the border with Namibia, is the home for some species of Stapelia, known for their spectacular flower smelling like rotting flesh, as it's pollinated by flies. 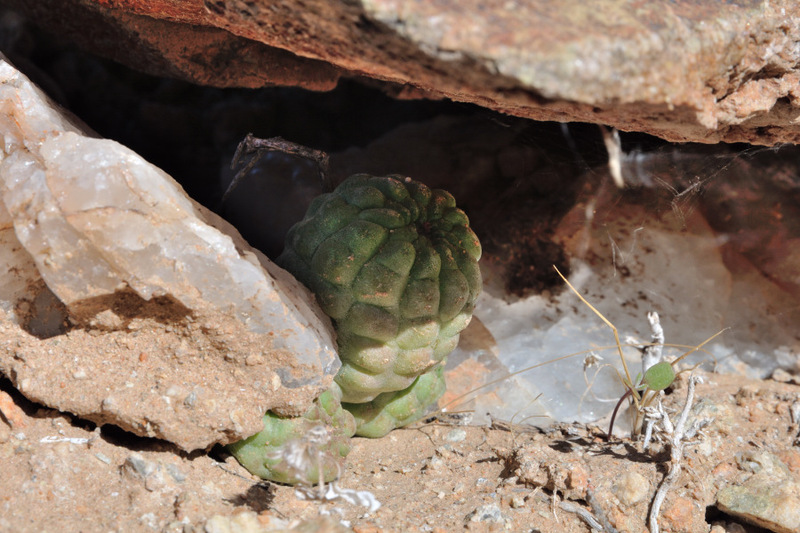 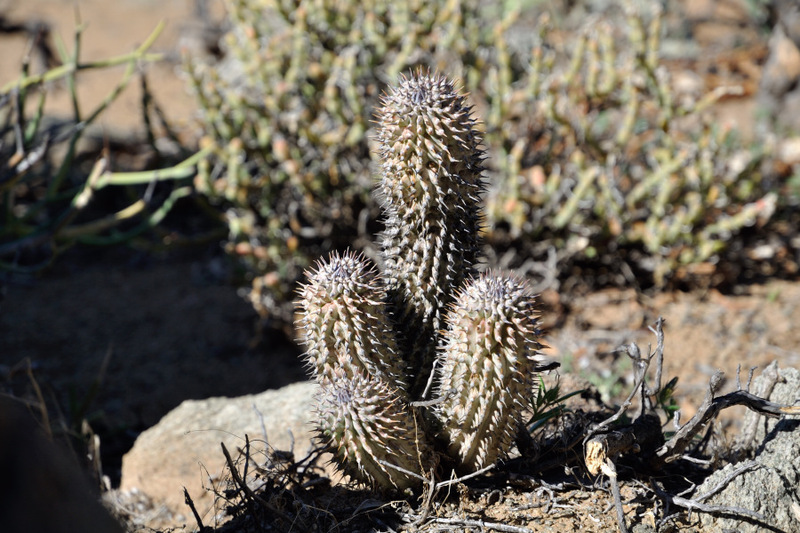 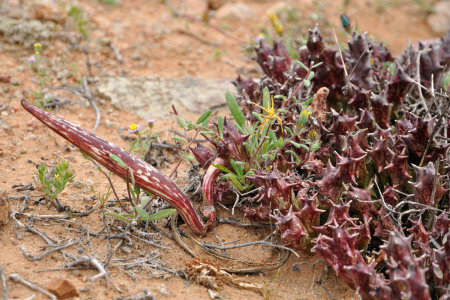 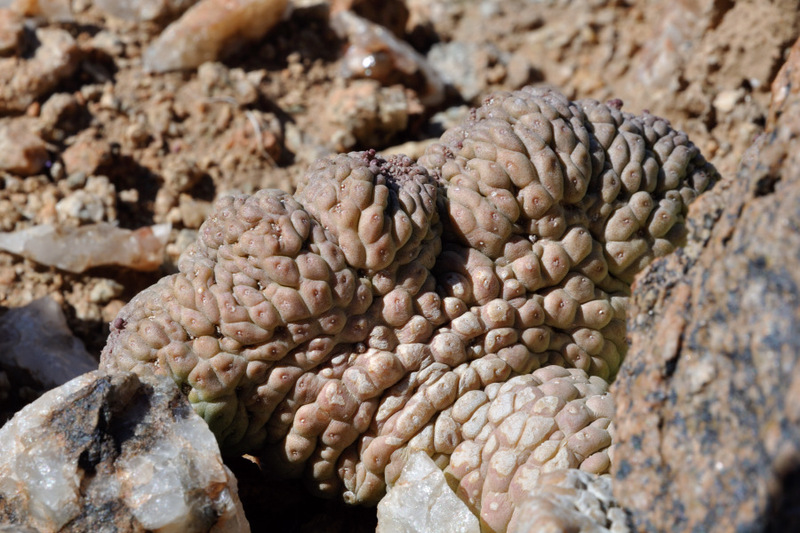 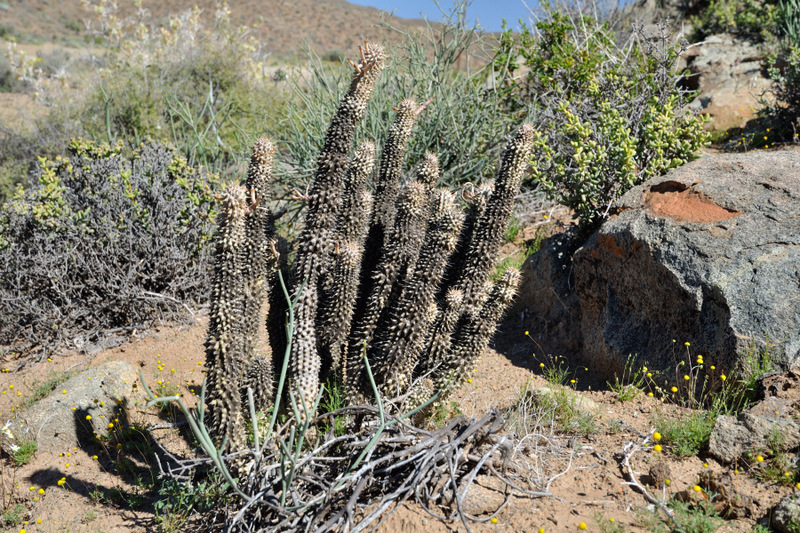 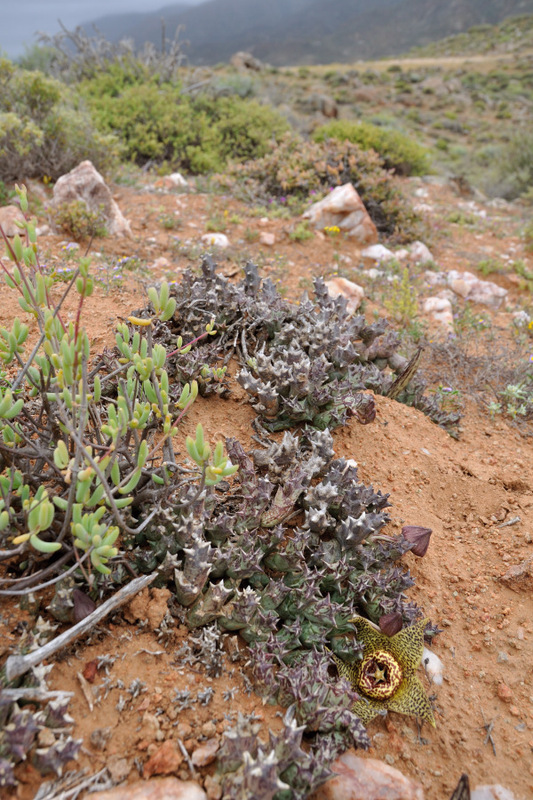 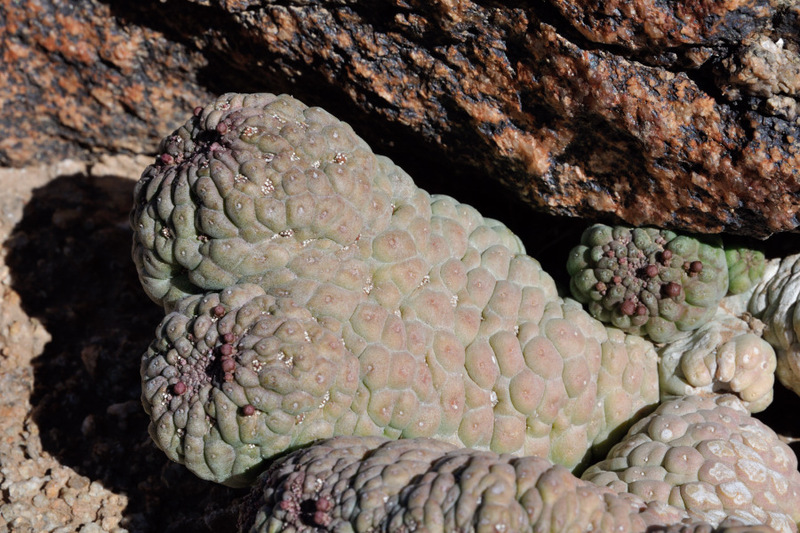 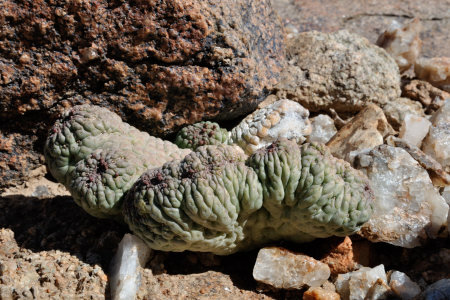 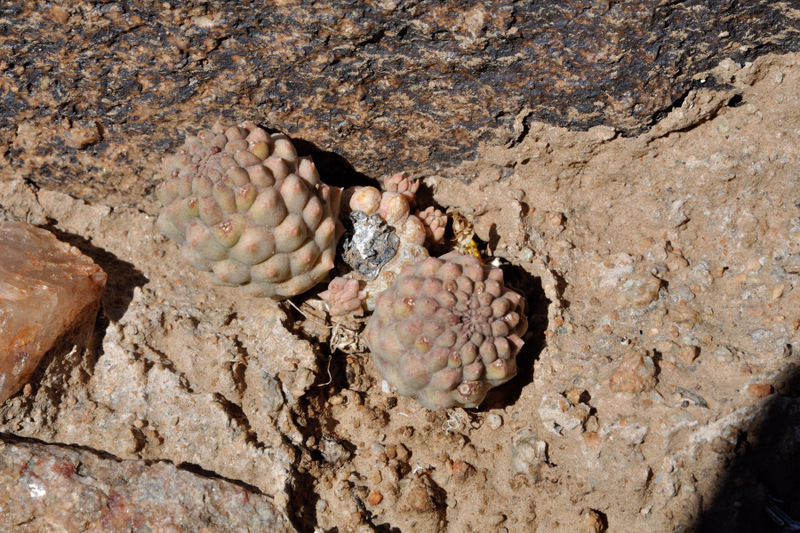 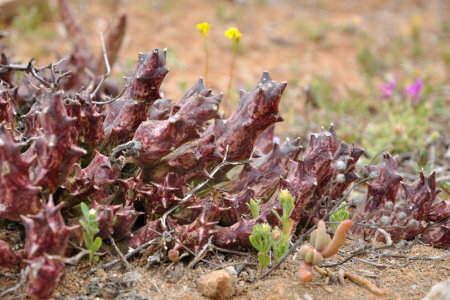 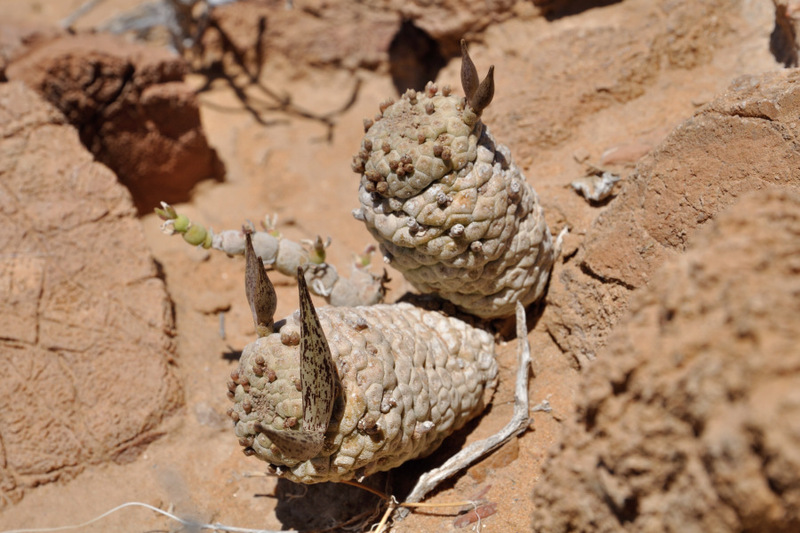 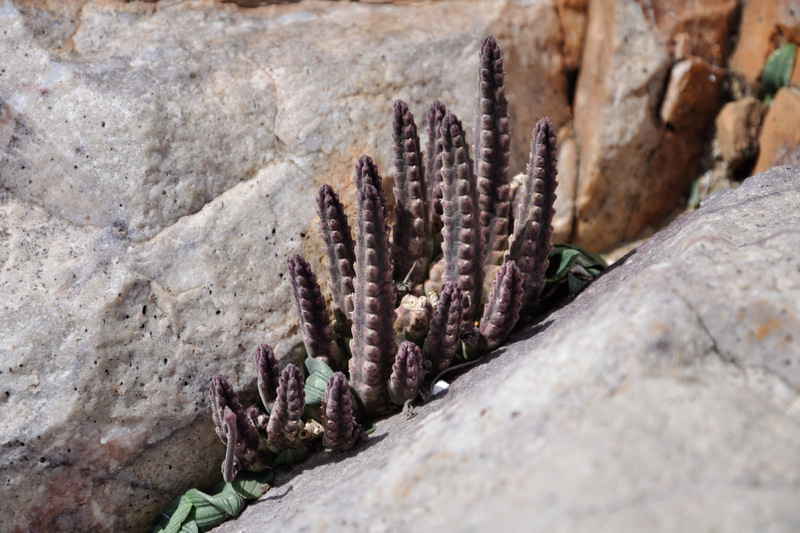 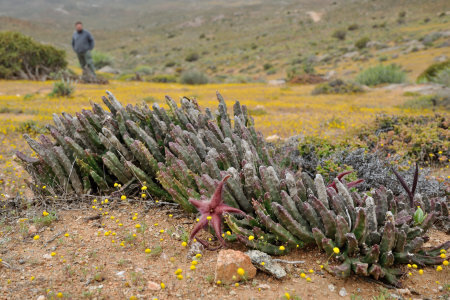 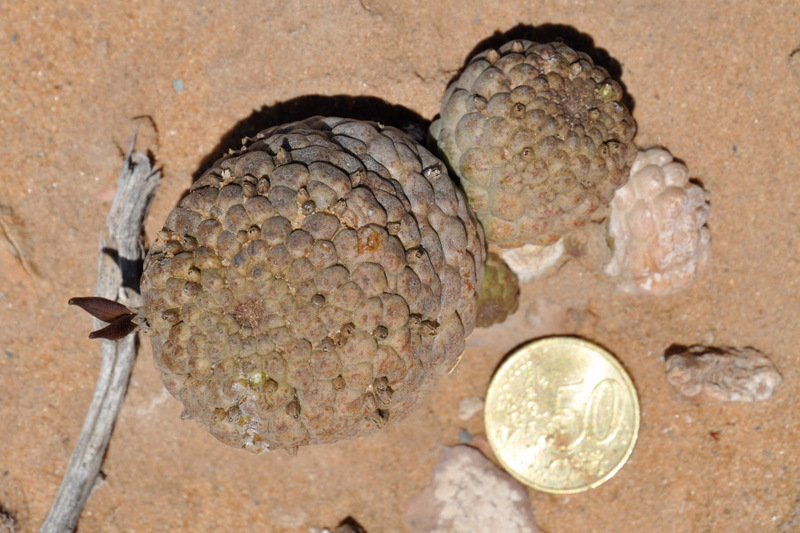 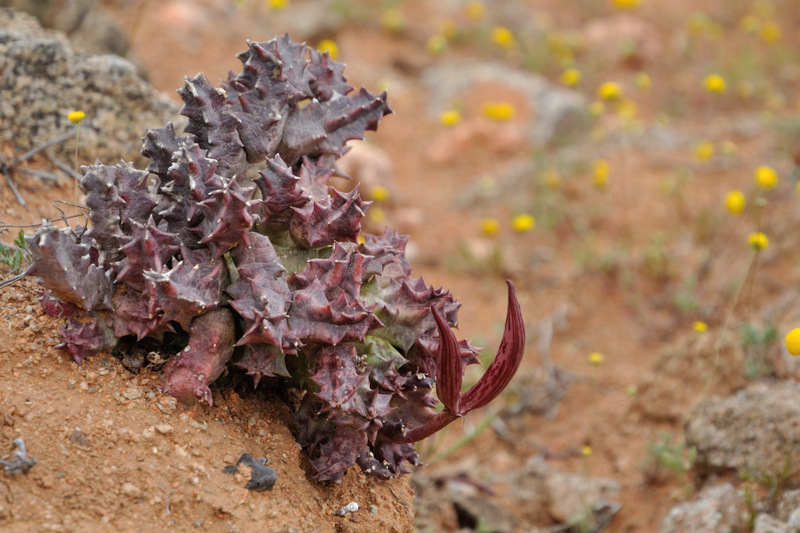 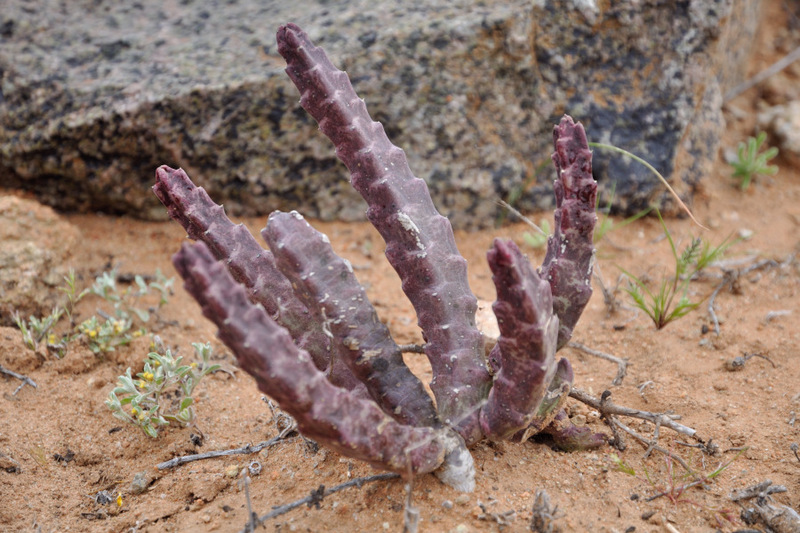 In Richtersveld and throughout Namaqualand, you will find also several other members of the same family (Asclepiadaceae), such as the odd Trichocaulon cactiforme or the Hoodia gordonii. Stapelia pictures. 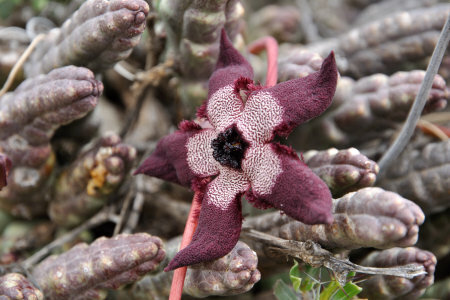 The Stapelias are succulents belonging to the family of Asclepiadaceae and are characterized by abundant development of secondary steams forming dense bushes. 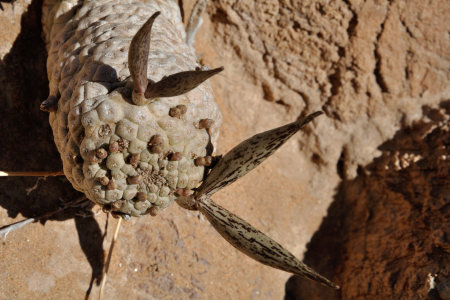 They are found in various areas of the Richtersveld desert in South Africa. Picture of Stapelia with seeds. 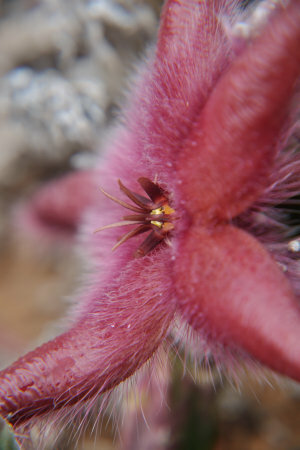 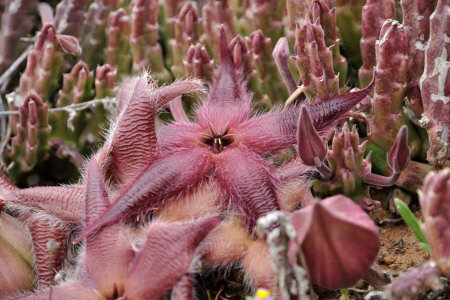 Photo of Stapelia gariepensis showing the aspect of the plant and its odd flowers. 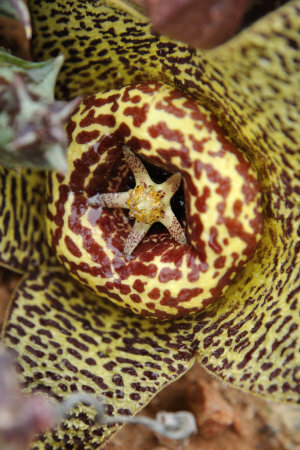 Stapelia flower picture. 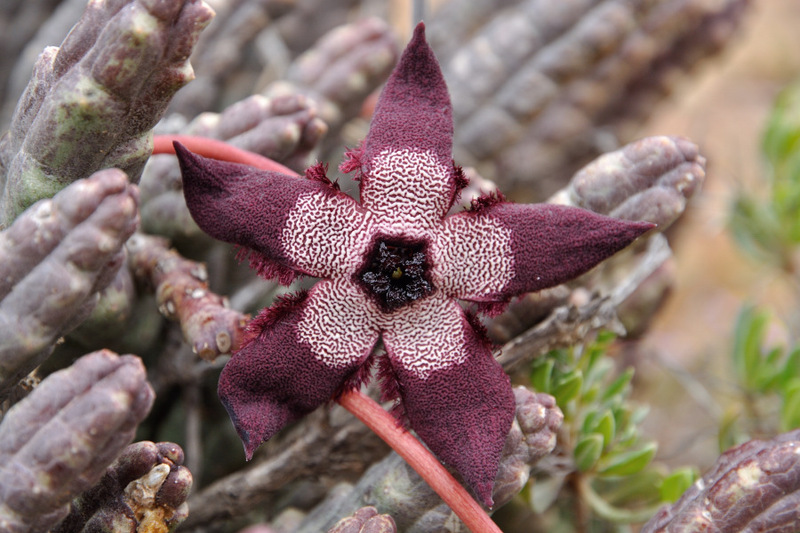 The stapelias, like other succulents belonging to the family of Asclepiadaceae and like orchids, have one of the most complex flower of all plant kingdom. 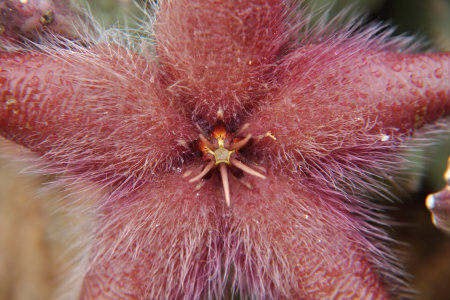 The stapelias do not have a real dusty pollen, but the pollen is organized into heavier agglomerates called pollinium. 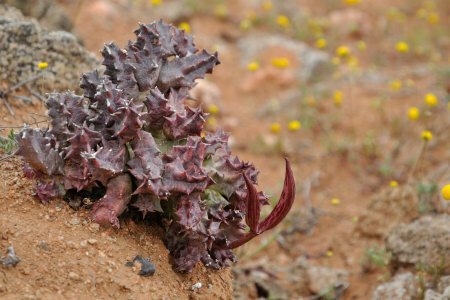 Probably this strategy can help to maintain fertility even in case of rain or dew, allowing the plant to keep the flowers open when the sky is cloudy. 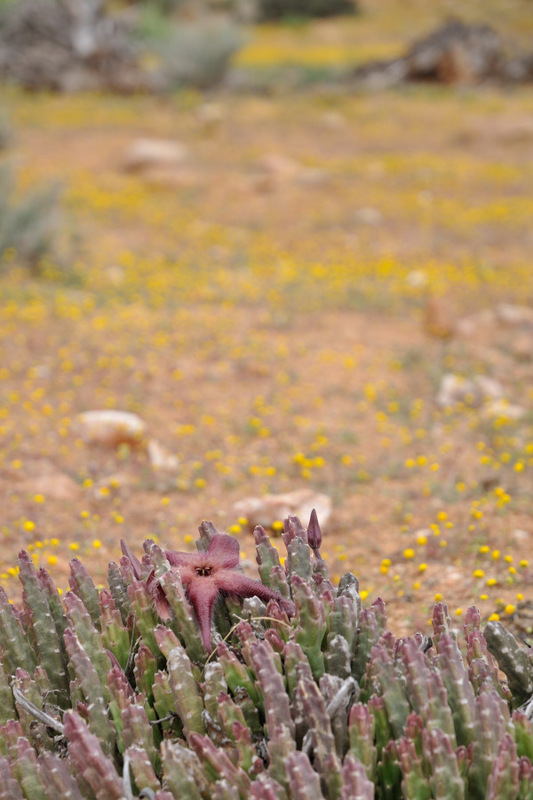 Stapelia photos. 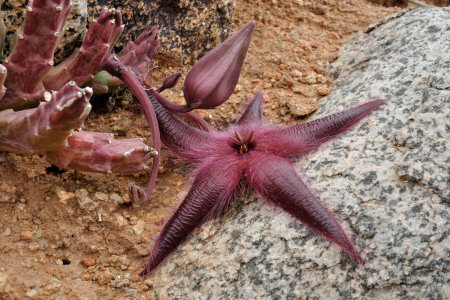 Due to the pollen organized into pollinium, the flowers of Stapelia gariepensis can be pollinated only by flies and, in order to attract these insects, the flowers have evolved a texture and an odor resembling rotting flesh. Picture of Tromotriche longipes flowers. 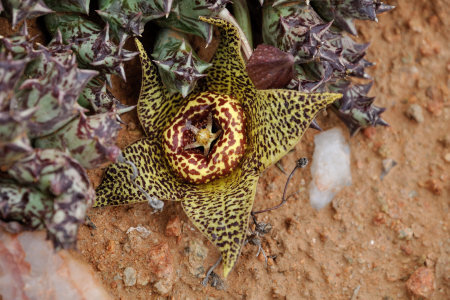 The Tromotriche is still a Stapelia, but some botanists prefer to classify it into a separated Tromotriche genus. 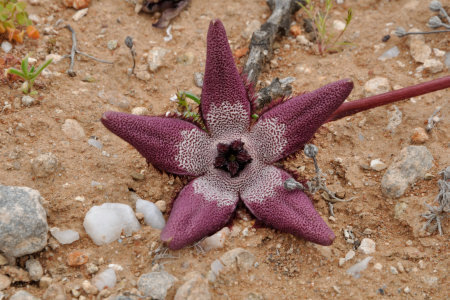 In fact, the morphological characteristics of the plant and of the flower are very similar stapelias, so it makes more sense to classify it as a Stapelia. More photos of Stapelia longipes (or Tromotriche longipes as classified by some botanists). 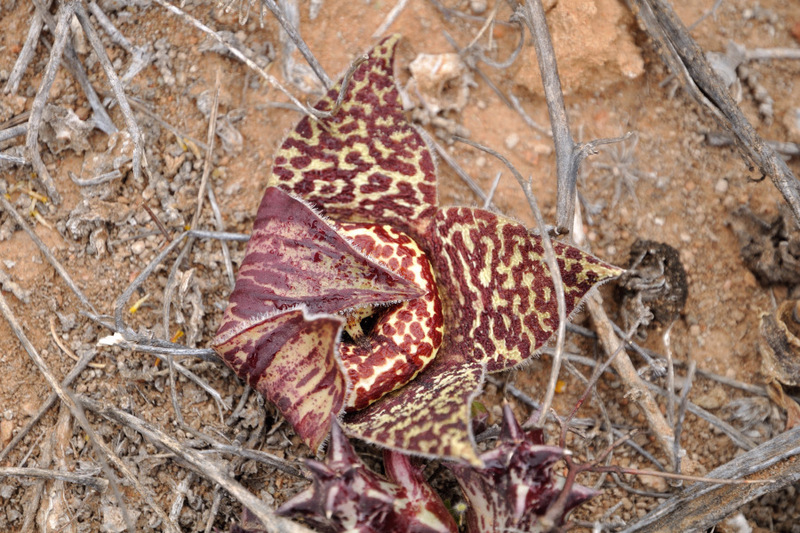 Picture of Orbea namaquensis. 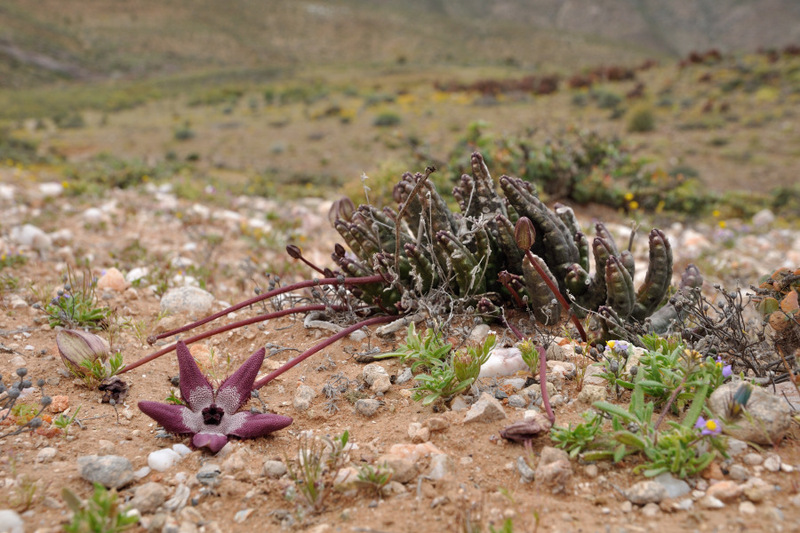 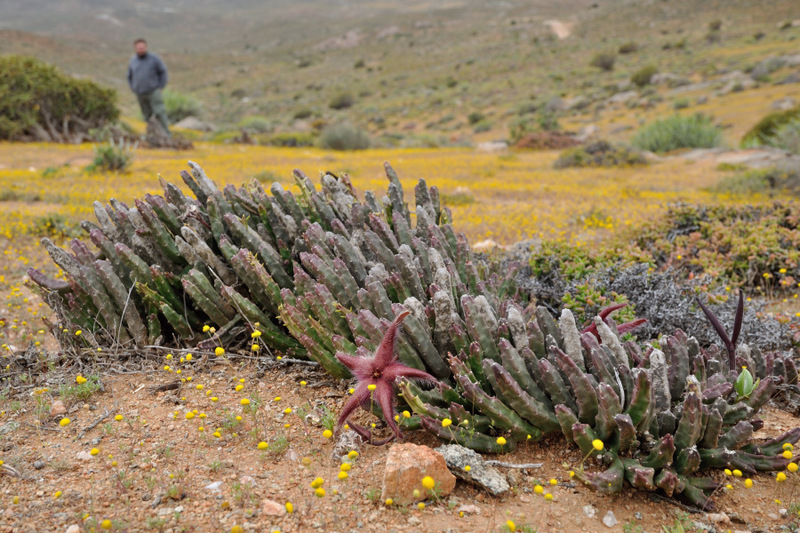 Even in this case there is a bit of confusion on the classification of this succulent, as some authors classify it as Stapelia namaquensis, while others prefer to use a separated Orbea genre. 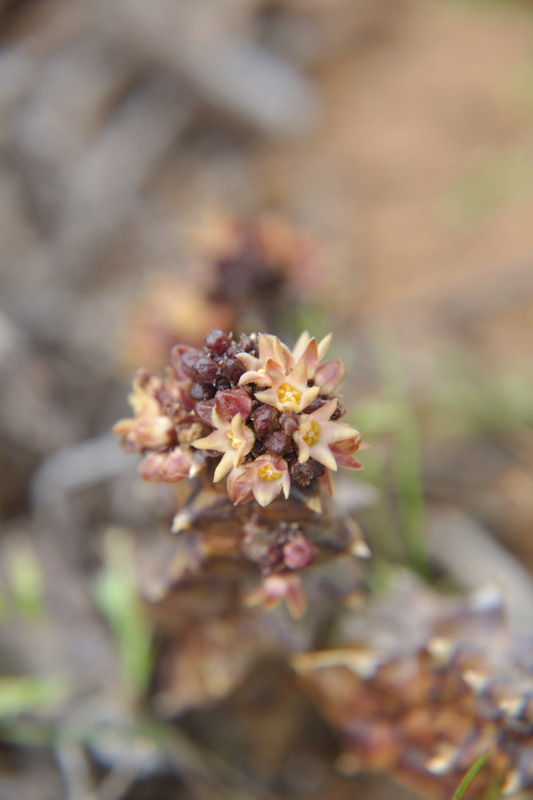 The stems are actually a bit different from those of other stapelias, but the characteristics of the seeds, as well as the structure and the evolution strategy of the flower, are very similar. 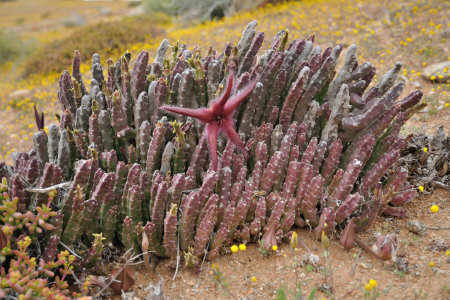 Photo of Orbea namaquensis (or Stapelia namaquensis). The general appearance of the plant and the beautiful flower with its unique features. 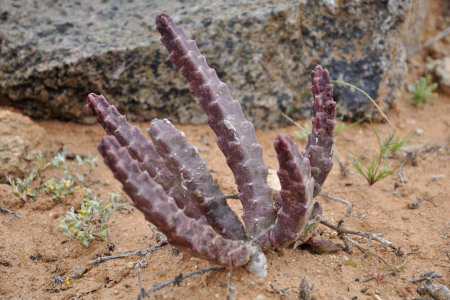 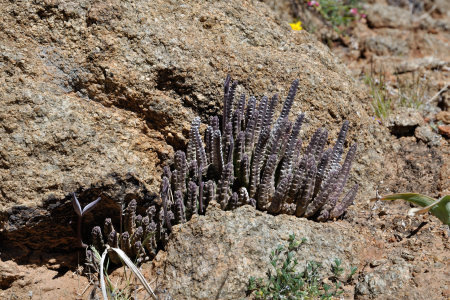 Picture of Trichocaulon cactiforme (classified by some botanist as Larryleachia cactiforme or Lavrania cactiforme or Pseudolithos cactiforme). 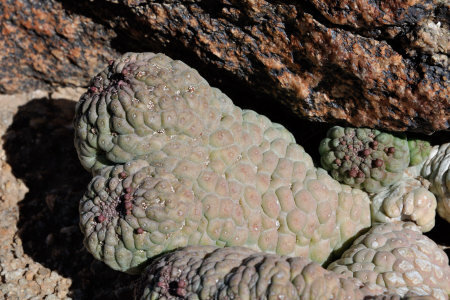 This succulent plant belonging to the family of Asclepiadaceae, has first a globular shape and then elongated when adult. 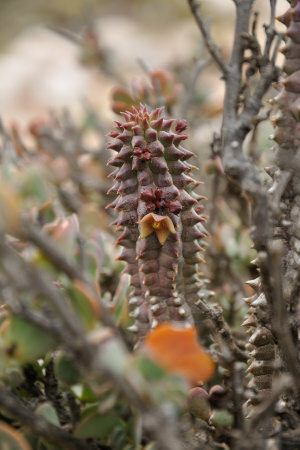 More photos of Trichocaulon cactiforme. In these pictures, very young specimens that grow protected by the rocks. 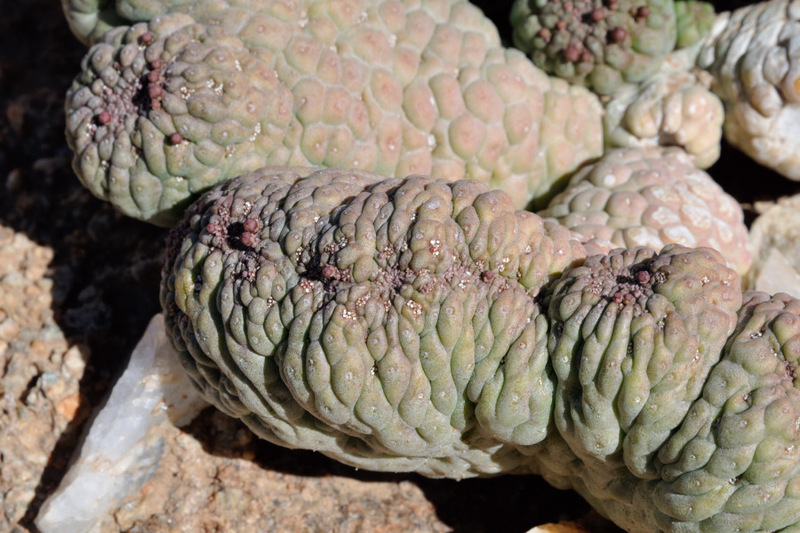 As in the case of other Asclepiadaceae, there is a bit of confusion regarding the classification of this plant, sometimes called Trichocaulon cactiforme, sometimes Larryleachia cactiforme, Lavrania cactiforme or Pseudolithos cactiforme. 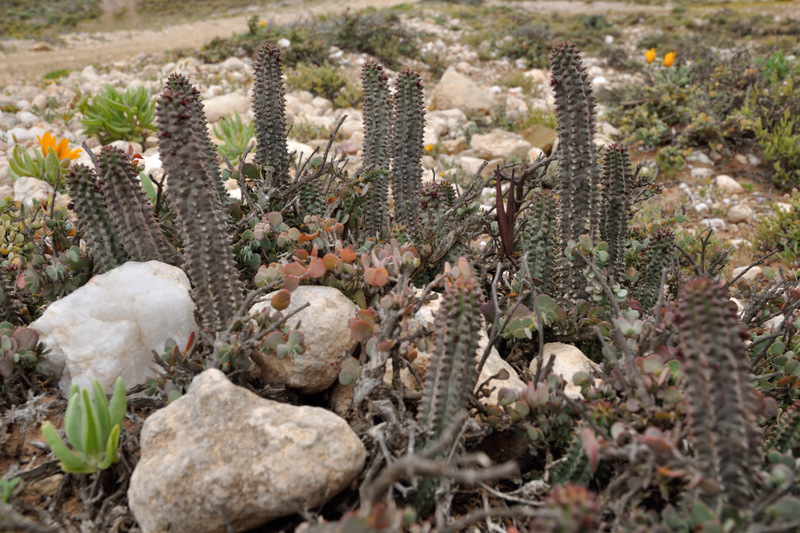 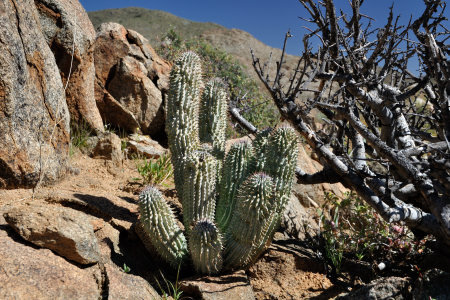 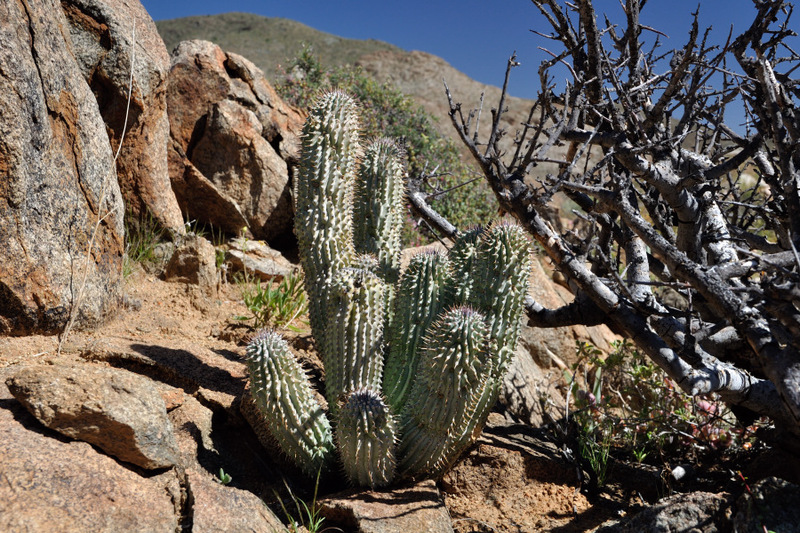 Photo of Trichocaulon cactiformis cristata. The form "cristata" of Trichocaulon cactiforme, sometimes referred as "monstrous", is a malformation that affects a very small percentage of plants, usually from birth. In a crested plant, the stem instead of growing cylindrical, it assumes the shape of a fan and presents numerous branches. 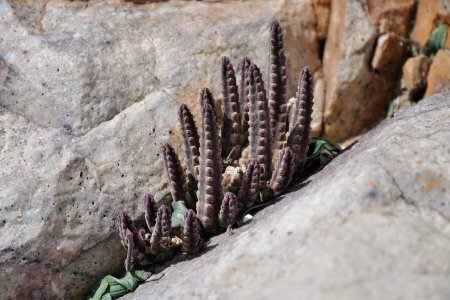 The seeds coming from crested plants produces normal plants, except the usual small percentage. 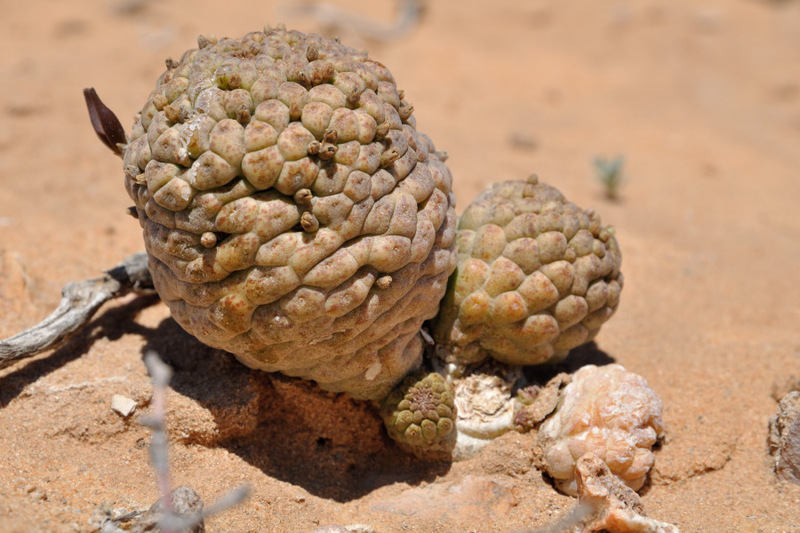 The reasons that trigger this malformation is not yet clear to the science. 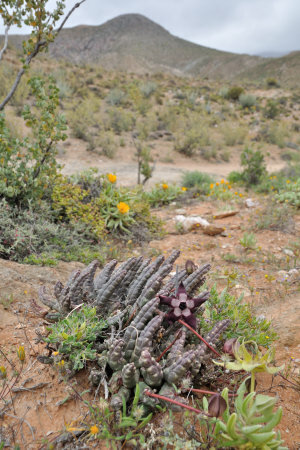 Picture of Hoodia gordonii. The Hoodia gordonii is a succulent belonging to Asclepiadaceae family and is quite common in South Africa, especially in Namaqualand and Richtersveld desert. Another succulent plant belonging to the family of Asclepiadaceae formed by elongated stems that produce small flowers along the sides and tips.